Conifer Village -More information coming soon! Metro Place Apartments -More information coming soon! Winthrop Apartments -More information coming soon! The Reserve at Riverside II -More information coming soon! 1111 Light Street -185,000 SF mixed-use development with 5,000 SF of street retail space. Project includes 91 multi-level condominiums, a 4-story office building and 6 townhouse units. Our scope of work for this project includes: Cold formed metal framing, light gage metal framing, sheathing, gypsum board assemblies, acoustical ceiling tile and finish carpentry. This project is set to achieve LEED Silver certification. M on Madison -A new 72 unit, 73,605 SF structure in Baltimore. Scope of work includes: Cold formed metal framing, light gage metal framing, sheathing, thermal insulation, gypsum board assemblies and interior paint. This project is seeking LEED Gold certification. Heights on Georiga (CB) -A new mixed used development designed with 69 apartment units and 10,000 SF of retail space. Work performed includes: Cold formed metal framing, light gage metal framing, sheathing and air barrier, thermal insulation and gypsum board assemblies. Building has been designed to comply with Green Community initiativesand the District of Columbia's Green Building Code. The Avenue at Park Morton (CB) -A new 83 unit, 7-story apartment building with a basement parking level and retail space. Work performed includes: Cold formed metal framing, light gage metal framing, DensGlass sheathing, Tyveck, thermal insulation, gypsum board assemblies and acoustical ceiling tiles. Building has been designed to comply with Green Community Initiatives. South West Towers (CB) -More information coming soon! North Pershing - New mixed-use project consisting of 188 residential units and 33,495 SF of ground floor retail. Our scope included the installation of the Henry AirBloc 33MR and 07 system. Mill Run -A total of 10 wood framed buildings which inlude 375 apartments in Owings Mill, MD. 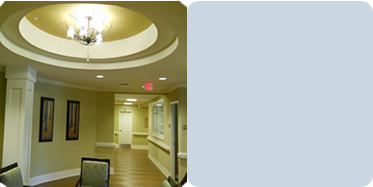 Work performed included gypsum board assemblies and acoustical ceiling tiles. 4100 Georgia Avenue (CB) -Located in Washington D.C. - Scope of work for this residential project included: cold formed metal framing, light gage metal framing, insulations, gypsum drywall, finishing, acoustical ceiling tiles and painting. Children's National Medical Center (CB) -6th and 7th floor renovation - Scope of work included: cold formed metal framing, light gage metal framing, gypsum drywall, high level finishing, acoustical ceiling panels, and installation of sound absorptive panels. Casa De Maryland -Project consisted of a complete historic renovation which included specialty stains, high performance paints customs designed interior partitions. Suffield -New Structure! Scope of work in this elegant design included: cold-formed metal framing, light gage metal framing, gypsum drywall, acoustical ceilings, insulation and painting. Parkside -Scope of work for this project included: cold-formed metal framing, light gage metal framing, gypsum drywall, acoustical ceilings and painting. Rollings Ridge -Project Consisted of developing 99 units. All building structures are supported by cold formed metal framing (Panelized sections). Our scope of work included light gage metal framing, gypsum drywall, rigid and non-rigid insulation, exterior sheathing and liquid air membrane, acoustical ceiling and painting. Chesterbrook Apartments -Construction of 82 new apartments. Work Performed included panelized structural metal framing, light gage metal framing, insulation, gypsum board and painting.